To upload an image to this website it must first be acquired by your computer and saved to your hard drive. This page deals with a couple of ways this can be accomplished. 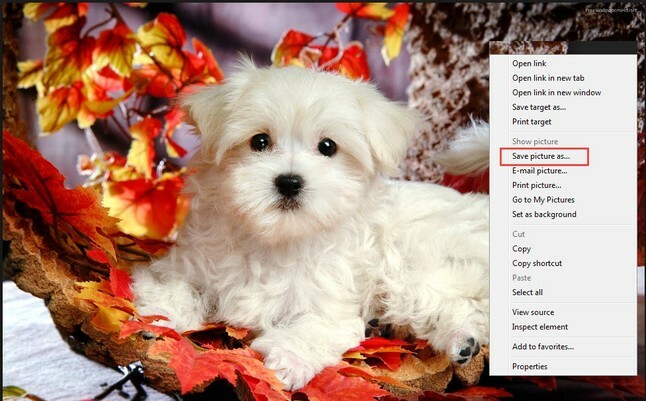 The easiest way to capture an image (not all websites allow you to do this) is to use the context menu. This is a menu that you may not be aware of. A context menu offers a limited set of choices when you click on an image which are usually actions related to the selected object. What's different here is that you select (or click) the image with the opposite mouse button to the one you normally use. Here, I have pointed my mouse to this picture and right-clicked. A menu appears. It may not look exactly like this one but you are only interested in finding a single command - "Save picture as...." If it is not present then the website has forbidden the copying of any pictures in this manner. If it is present, click the command and save the image to your computer (more about that later). It is possible to capture the entire screen by pressing the Print Screen key on your computer keyboard. It is suggested that you have the window you from which you are capturing maximized before pressing this key. Please note that Print Screen on some keyboards might appear as PrtScn, PRTSC, PRTSCN, or a similar abbreviation. Certain laptops and other mobile devices that lack a PrtScn key might use other key combinations, such as FN+Insert, to capture the screen. Check the manual the came with your laptop or device for specific instructions. Next, click start in the lower left corder of your screen. In the search field that appears type the word Paint . In the search results that appears look for an image that looks like this and the click it. This will launch the Paint Application. Paint is a simple computer graphics program that has been included with all versions of Microsoft Windows. In Paint, on the Home tab, in the Clipboard group, click Paste. At this point you may have to change the size of the image, etc. But, we will discuss that later. Simply give the image a name and save it to your computer. Right-click on the image and select "Open." A menu bar will appear at the bottom of the image. Click on Options and the image to the right will appear. Click on Download. You will be asked where do you want to save this file. Provide a location (more about this latter) and click Save. You have now successfully acquired the image and saved it to your computer hard drive. You can now upload it to our website. Connect the camera directly. You can import pictures by connecting the camera directly to your computer using a universal serial bus (USB) cable. With this method, your camera must be turned on, so importing pictures will use up some battery power. You'll also need to keep the cable handy if you import pictures regularly. Connect through a memory card reader. The fastest way to import pictures is to use a memory card reader. Remove the memory card from your camera, slide it into the card reader, and then plug the card reader into your computer's USB port. Many computers have built-in card readers, allowing you to slide memory cards directly into the computer. The only way to capture actual photographs or small images such as drawings or paintings is through the purchase of a scanner. If you own an All-In-One printer, you can use the scanning capabilities of that device to capture your images. There are several applications that can capture an image directly from any screen regardless of the way the site wants you or doesn't want you to download the image. Be sure to watch the video "Altering images in IrfanView"
If you need any asistance with capturing images or any other technical issues please contact Tech Bird at TechBird65@aol.com.